Over the winter I decided to change my management system over to Accuair’s E-Level and finally had a minute to throw together a little install guide. 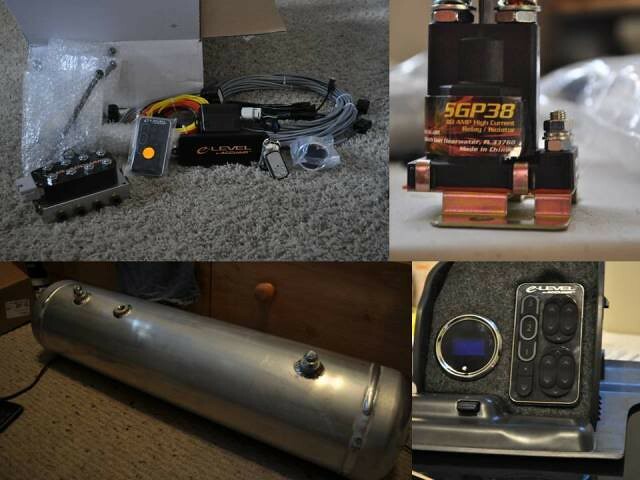 I started this journey by calling my buddy Andrew over at Open Road , ordering the E-level, VU4, Dakota Digital Gauge, Wireless Key Fobs, Stinger Solenoid Relay, Accuair’s New 5-Gal Aluminum Tank, and a bunch of fittings of course. While planning the trunk, I was also polishing the tank and that took a while seeing as how I was also polishing my wheels. So I took a break from polishing for a day or two and continued on with some wiring. I started by removing the driver and passenger kick plates as well as the rear seat. I made a wiring harness for the Dakota module, I used a different color wire for each bag to make it easier to connect everything once it was in. I also decided to run the sensor wires at this point. I ran the front sensor wires along the kick plates. I chose to drill a 3/8” hole in the wheel well and install some ¼” rubber grommets. I put a dab of super glue on each one to hopefully keep them from coming out. 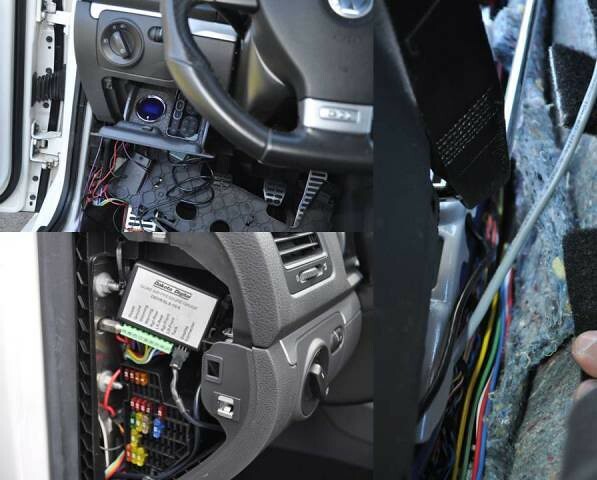 To get the sensors outside the car you will need to cut the wires. Make a careful slit in the gray housing exposing enough of the wires that they can easily be worked with. You can either solder them back together or use good crimp connections. All of the connections should be covered in shrink tubing with either method. I ran the rear sensor wires in the same manner by drilling holes in the corners in the rear of the hatch area. I forgot to take photos and they are now covered back up by the carpet. 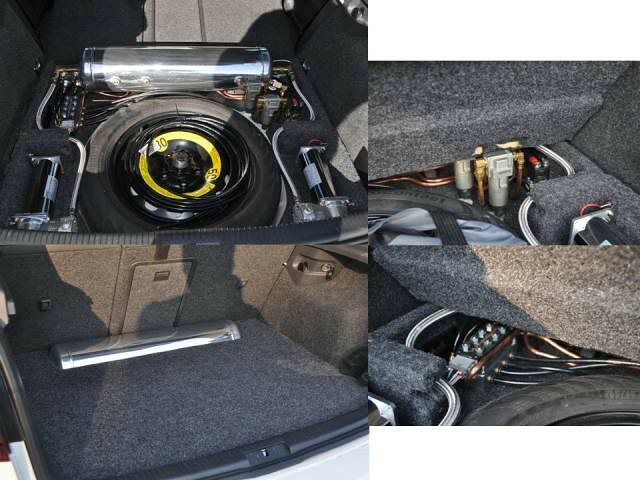 I also previously had a compressor power wire, and 12V accessory wire ran from my previous install. Once I finished the tank, I started hooking all the components up. I installed the stinger 40A relay, running the 4 gauge wire to the input side, and then running a 4 gauge wire from the output to a distribution block splitting into 8 gauge wire for each compressor. I also attached all the signal wires to the pressure senders using ring terminals for easy removal. I ran all my compressor, ecu, manifold, and sender grounds along the outside of the box to a single grounding block. I then mounted the tank and manifold running the fill lines to 3/8” bulkhead fittings underneath the tank. One of the water traps is directly mounted to the tank and copper hard lined to the manifold. The second water trap has hardline from both the tank to the trap and trap to manifold. This is the finished setup with the polished tank, hardlined manifold and false floor. I hinged the false floor so I can get to anything I may need out of the bag I keep the jack, lug wrench, some tools and my most important BBS wrench in. After everything was function/ leak tested, it was time for the most important part of any E-Level install, the leveling sensors. I started by taking max and min measurements to determine the overall length of travel and midpoint of travel. Measures from the center of the axle to the fender all the way out and filled, then find the midpoint of the distance traveled. 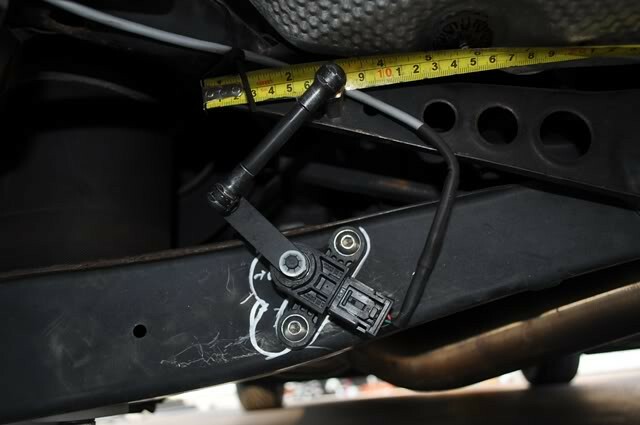 With the front of the car jacked up and resting on jack stands, you can now determine you desired location for the sensors. I chose to mount them directly over the control arm. 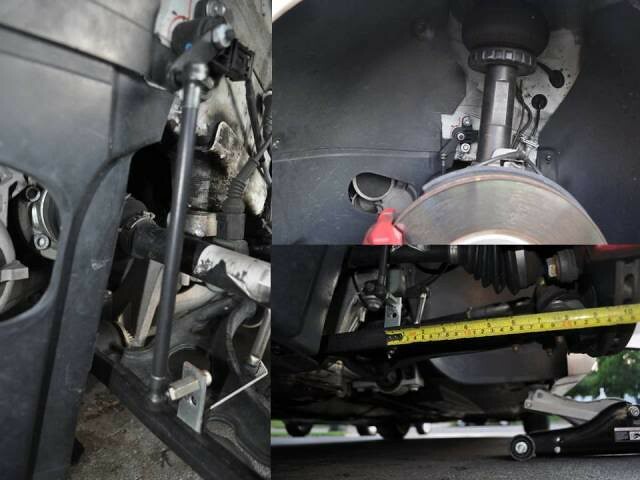 I started by using the jack to place the center of the axle at the midpoint of the travel. I mounted the sensor behind the strut using two self tapping screws. Using some 1” galvanized brackets I had laying around, I trimmed up some brackets to attach the arm to. *You want the arm of the sensor to be at the midpoint of its allowable range of motion when the suspension is at the midpoint of travel. 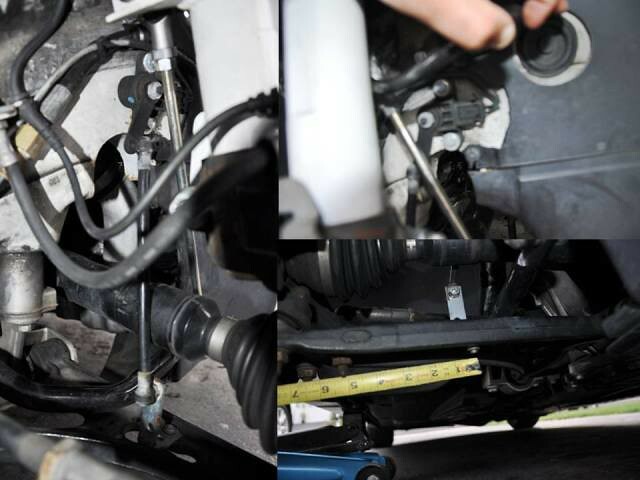 * Then move the suspension through its range of motion while holding the bracket in place. You want to verify that the sensor does not bottom out prematurely and that the sensor arm is vertically level, or as close as possible. This will help to prevent premature failure of the sensors. I followed the same process for the passenger side verifying no interference during the process. The rear was the next and a little bit trickier. I decided to use drive on ramps instead of jack stands, it helps with visualizing the travel of the rear control arms. I decided on mounting the sensor to the lower control arm. I started by mounting the fixed mount for the arm, first trimming about 1/8” off the hex coupling. This allowed me to make the leveling arm more vertically level and less susceptible to damage. The location I chose for the top mount was approximately 3” from the outside edge of the upper stress bar. This location had enough range of travel without over extending the sensor. The sensor body was mounted using the supplied hardware, although I did put some washers behind the body to help shim it out. 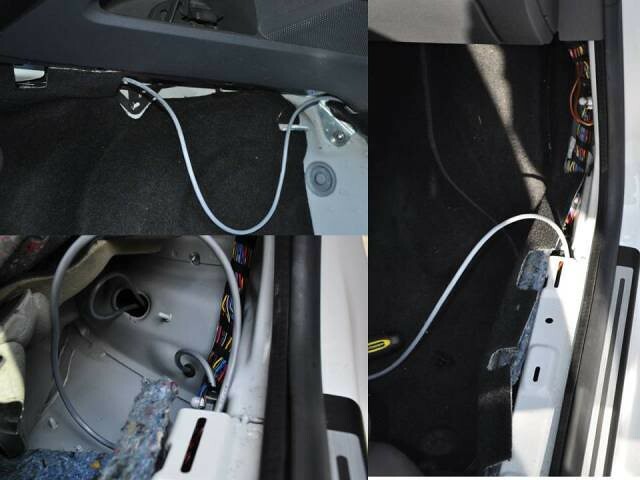 Then move the car to the middle of the range of travel and trim the arm so that the sensor is again at the midpoint of travel while suspension as the middle of its travel. For the rear, the drivers and passenger side are as close to identical as they can be. After a year of having the e-level, I decided I wanted to try the sway bar in there. My bombers came without sway bar mounts so I pulled them out and sent the to Mr. Drew Dorbritz to have some oem tabs welded on and a fresh coat of candy white applied. After getting everything back in and working it was time for a sensor reposition. 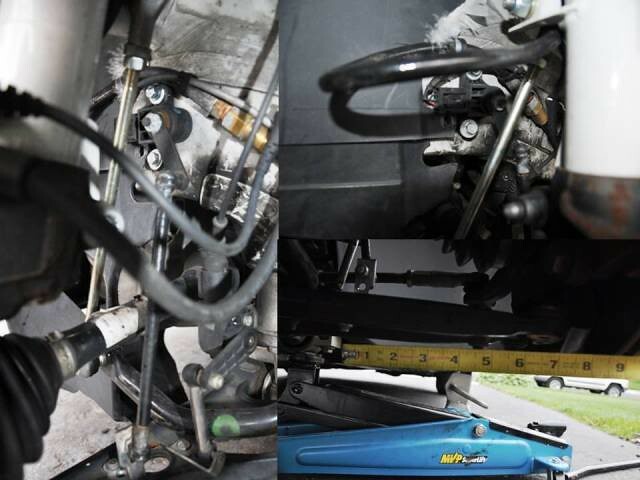 This was the third time I was doing them with a sway bar so I took some photos and finally have the time to upload them. 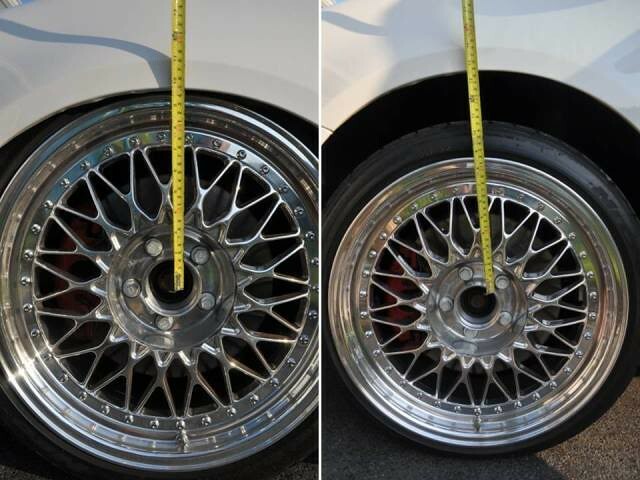 Both sides are essentially in the same location with the arms rotated toward the rear of the car as opposed to the front as they were previously. When doing the lower mounts you can either use the angle bracket or weld some tabs on. I've done both ways but decided to bolt for my car to get done as quick as possible. 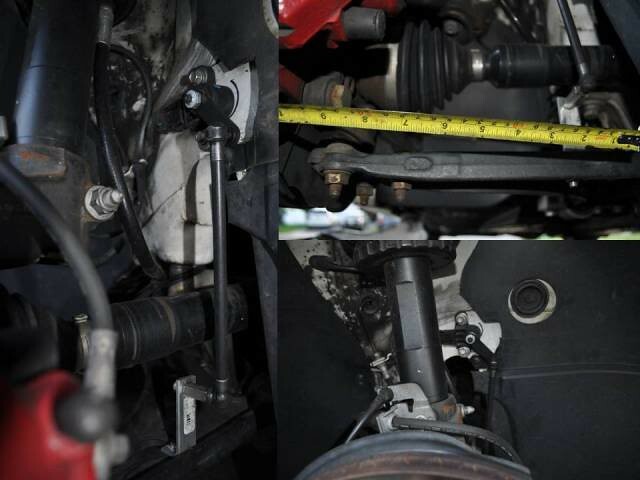 The key when installing with the sway is to place the car at your desired ride height with a jack on the control arm and turn the wheels back and forth to ensure that the endlink will not contact the sensor. Feel free to ask me any questions, I don’t mind helping out. Damn Dood this looks so awesome. I can only strive get mine this clean. How many days did this take you? I talked to Reno at Accuair today and he gave me some good tips on mounting the sensor arms too. You have been a great help. Thanks. Car looks clean man. Polishing the tank took me about a month, but once that was done things move quickly. The overall install took me about 3 days because I took my time, had my stock suspension back in the car so I was not too worried. The key to the sensors is work slow and check 4 times before drilling or cutting anything. 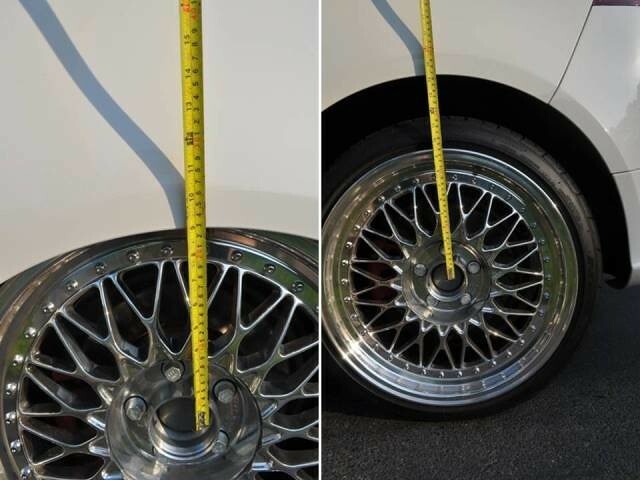 Also, make sure the car goes as low as you want before installing them. Changing the range of motion after they are in will increase the chances of breaking a sensor. The red wire, constant power, I spliced into the main 4g wire at y distribution block for the compressors. Orange, accessory turn on, I ran to my fuse panel on the side of the dash to slot 42 (rear wiper, could be wrong number) using an add a circuit from pepboys. The headlight, purple wire, run to the dimmer switch solid gray wire. Shoot me a pm if you need any other help. Looks like a lot of time and thought went into this. hey man what did u use to set your controller in your under dash tray like that? also! where did you run your airlines from the rear of the car? 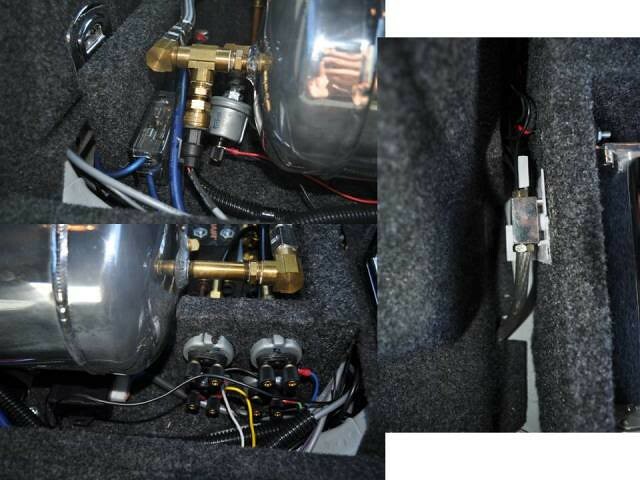 i dont want to sart cutting into the trunk if i can run the airlines inside the car, do you have pictures of the lines from the manifold going anywhere? The controller mount was made with some plywood and fusor plastic I had laying around. Cut the ply to the shape of the cubby and then use the fusor to mold it. I'm thinking of making a new one that is all plastic or a plastic/fiberglass combo that fits a little better. My lines go from the manifold to 4 bulkhead fittings underneath my tank. From there the fronts go along the brake and fuel lines, rears just out and to the bag. I do have some photos on my other computer I think, pm me your email and any deacription of any photos you might find helpful, I'll take some if I don't have them. not to be a pain but do you have any pics of the process? or before your put it in the cubby? I unfortunately don't have any pics of the process, I can pop it out and take some photos if you would like, just shoot me a pm with an email this way I can shoot you some decent size photos and a little blurb on how to go about making it. This really depends on the struts you're using. I used the fully extended number as a reference for the center point of travel. 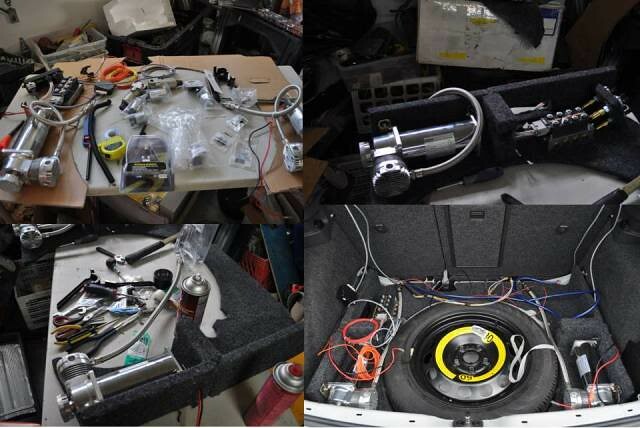 The airlifts I installed with elevel, the fully extended with the wheels on the ground was different than in the air. You just want to make sure that the sensor arm rotates without contacting the sensor body at both extremes. Great write up!! Thanks for putting it together. Nice write up for sure dude. 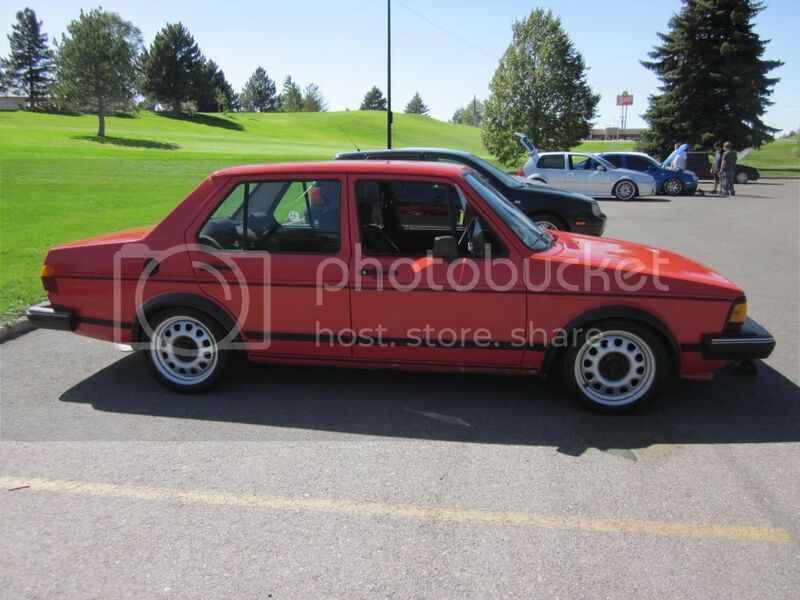 i'm planning on running Bilstein's in the back. 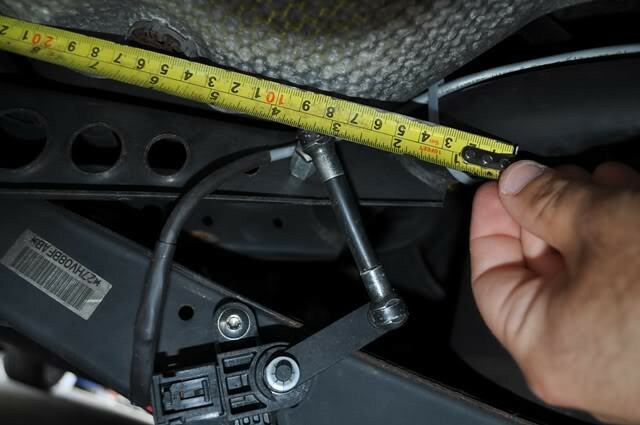 so would you recommend i measure the full extended length with the car in the car so if it gets jacked up, the sensor arms will be fine? That will work, nothing wrong with using that as your max extension point. You just want to make sure that at the mid point of travel the sensor is at its midpoint. how did you mount the bracket to the control arm in the front? Thanks, I know you said you had the bracket laying around but where did you get it and how long is it?